Despite the stain-resistant power that its name suggests, stainless steel is susceptible to certain stains. This is especially true if you leave the staining material on the stainless steel for a while. Luckily, the metal is fairly easy to clean even if you've gotten permanent marks on it. Spray glass cleaner on the marker stain. Let it soak in for 2 minutes. Wipe up the glass cleaner with a paper towel. Rub the stain as you wipe to get as much of it off as possible. Apply a drop of mild liquid dish soap to the stain if it is still visible. Run a toothbrush under clear water and scrub the dish soap into the stain. Scrub along the stainless steel grain to remove the stain. Wipe up the dish soap with a paper towel. Dab white vinegar into the stain with a clean cloth if it is still visible. Mix a thick paste of baking soda and water if the stain is still visible. The paste should be the same consistency as toothpaste. Apply the baking soda paste to the stain with a toothbrush. 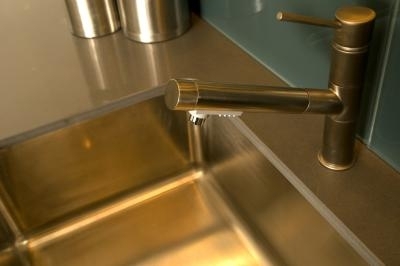 The baking soda will act as a mild abrasive, which will not scratch the stainless steel but will help remove the stain. Wipe up the area with a wet paper towel and dry it completely with a clean cloth.